The revolutionary and dynamic Space Scooter X580 Pink offers two different riding modes to transform the way you scoot. Regular Scooter mode is perfect for beginners who want to progress their riding skills to the next level. In Space Scooter mode, everything changes. Just click the deck into place and glide off into space without having to push off the pavement. All you have to do is pump the deck up and down with your feet and away you go. Shift your weight from your front foot to your back foot to get moving–the faster you pump, the faster you scoot! The Space Scooter Pink is equipped with a clever safety feature that uses loud clicks to warn riders if too much force is being applied to the scooter deck when they push down. It features height adjustable handlebars with soft grips so the rider can glide in comfort. The spring loaded kickstand, 200mm wheels and alloy brakes make this Space Scooter a top performer. The pink wheels and the graphics on the deck add to this Space Scooer’s cool look. 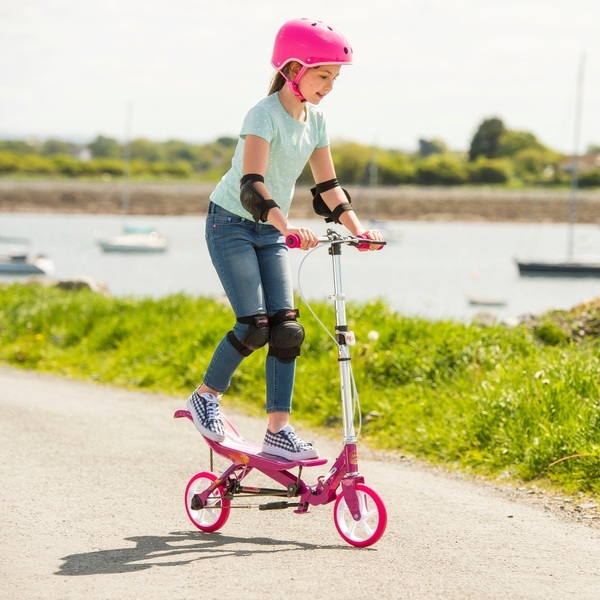 The Space Scooter Pink can be folded quickly for easy storage and performs best on a flat hard surface.